The stunning popularity of the “New Atheist” movement-whose most famous spokesmen include Richard Dawkins, Sam Harris, and the late Christopher Hitchens speaks to both the growing ranks of atheists and the widespread, vehement disdain for religion among many of them. In Faitheist, Chris Stedman tells his own story to challenge the orthodoxies of this movement and make a passionate argument that atheists should engage religious diversity respectfully. Becoming aware of injustice, and craving community, Stedman became a “born-again” Christian in late childhood. The idea of a community bound by God’s love-a love that was undeserved, unending, and guaranteed captivated him. It was, he writes, a place to belong and a framework for making sense of suffering. But Stedman’s religious community did not embody this idea of God’s love: they were staunchly homophobic at a time when he was slowly coming to realize that he was gay. The great suffering this caused him might have turned Stedman into a life-long New Atheist. But over time he came to know more open-minded Christians, and his interest in service work brought him into contact with people from a wide variety of religious backgrounds. His own religious beliefs might have fallen away, but his desire to change the world for the better remained. Disdain and hostility toward religion was holding him back from engaging in meaningful work with people of faith. And it was keeping him from full relationships with them the kinds of relationships that break down intolerance and improve the world. In Faitheist, Stedman draws on his work organizing interfaith and secular communities, his academic study of religion, and his own experiences to argue for the necessity of bridging the growing chasm between atheists and the religious. As someone who has stood on both sides of the divide, Stedman is uniquely positioned to present a way for atheists and the religious to find common ground and work together to make this world the one world we can all agree on a better place. “Christians like me have heard lots of ‘testimonies’—how I once was lost but now am found, was blind ... and so on. We’ve heard how atheists converted to Christianity, how backsliders came back to piety, and how heretics returned to orthodoxy. What we haven’t heard enough of is testimonies about how a Christian became an atheist or how an atheist became a faitheist or how a gay Evangelical came out of the closet and out of the church. I’ve never read, heard, or met anyone better suited to this task than Chris Stedman. His beautiful writing voice, his poignant story-telling skill, his clear-eyed insight, his humane and humble empathy uniquely equip him to bear witness to everyone—especially Christians like me. Rigid anti-theists and theists alike will be challenged as they read—challenged to greater humanity, empathy, and understanding. Wholeheartedly recommended.”—Brian D. McLaren, author of Why Did Jesus, Moses, the Buddha, and Mohammed Cross the Road? "His book about being religious and being secular, together, offers his hope for a better world." "An enlightening and engaging memoir." "Faitheist, a new memori by local author Chris Stedman, promotes a warm, loving, and witty serving of intercultural dialogue." I had never heard the word “faitheist” before, but I was pretty sure it wasn’t a compliment. I blushed and ran my hands through my short coffee-colored hair--a nervous habit--and cleared my throat, asking if it was intended to be an insult. It was my first experience with the atheist movement, and for at least a moment I thought it might be my last. I’d been an atheist for a while, but I had hesitated to seek out a community of nonreligious people. I imagined that secular folks would be difficult to organize; that assembling atheists, agnostics, skeptics, freethinkers, and other nonreligious individuals would prove tricky because our common thread--that we are not something--underscores only what we do not believe. But as I progressed in my work as an interfaith activist, I noticed that one of the things that actually made people good at it was a groundedness in one’s own identity. That, paired with my longing for a community of common belief, led me to begin searching for an organized community of nontheists. The brusque brush-off occurred at a reception following a public discussion organized by a nonreligious group; the topic had been how the nonreligious--more specifically, atheists, agnostics, and other nontheistic, nonreligious people--should approach religion. I had suspected that there would be mixed feelings about religion. After all, I knew of the popular atheist discourse on the subject, which cast the religious not only as incorrect about metaphysical realities but as standing in the way of social and intellectual progress. But I had also hoped that someone might offer a more balanced perspective on religion, locating within the beliefs, desires, and actions of religious people similar values held by many nonreligious people. I had gone with optimism and excitement. At the time, I was both an atheist and an intern for Interfaith Youth Core, an organization that helps mobilize young people to change the public narrative on religion from one of conflict to one of cooperation by engaging in dialogue around shared values and collaborative action. Because of my work, I felt I was in a particularly good position to discuss religion in the lives of nonreligious folks. I pictured myself saying with a well-meaning grin, “Hey, I work with religious people every day and my atheism is stronger than ever!” I hoped I might even serve as a bridge between two communities that are so oft en pitted against one another, to offer my insights as a nonreligious person working in an interfaith environment. That aspiration was quickly curtailed. Throughout the program, religion--and religious people--were roundly mocked, decried, and denied. I’d arrived hoping to find a community bound by ethical and humanitarian ideals. Instead, I felt isolated and sorely discouraged. Though I was disheartened by the event, I went to the post-panel reception, held at one of the panelists’ apartments, because I hoped that if I spoke with more of the group members I’d find some people who shared my opinions or learn a bit more about why they believed differently than I did. Also, as a thrift y graduate student, free dinner and drinks were hard to pass up! I walked in and instantly removed my shoes. The apartment was beautiful; the ceiling-to-floor windows allowed for a stunning view of Chicago’s orange-and-white-lit skyline. The living room was impeccably clean. (I made a mental note to at least shove my dirty laundry in the closet when I got home.) I stood there and scanned the crowd; I was easily the youngest person there and unfashionably underdressed (nothing new there). Looking down at my feet, I noticed there was a hole in each of my socks. Maybe I should’ve left my shoes on, I thought. I paused, debating whether I should say anything. My “Minnesota Nice” inclination warned me to let it be, but I had to say something. So I started small, asking them to consider that diversity of thought and background fosters an environment where discourse thrives, where ideas are exchanged, and where we learn from one another. I was stonewalled: “We have the superior perspective; everyone else is lost,” said the woman with a flick of her hand that suggested she was swatting at an invisible mosquito. As a former Evangelical Christian, these words were hauntingly familiar, and they represented a kind of sure-handed certainty and dismissal--a kind of fundamentalist thinking, really-- that I’d hoped to leave behind with my “born again” beliefs. Our conversation continued, and I offered up petitions that the positive contributions of religious people be considered with equal weight alongside the negative. “Oh, I get it,” the man jumped in with a sneer. “You’re one of those atheists.” I wasn’t sure what he meant, but it didn’t sound like a good thing. I shifted my weight from one side to another--another nervous habit--and picked at an hors d’oeuvre that I thought might be some kind of cheese. Not a real atheist. I’d heard words like that before--in my youth, when I was told I couldn’t be a real Christian because I was gay. Once again I didn’t fit the prescribed model, and I was not-so-gently shown the door. Now, atheism is a bit different from Christianity in that atheism isn’t a belief system. It’s an identification marker that unifies a minority of Americans who do not believe in God. But the implication was clear: you’re at the wrong party, kid. The next day, I attended my weekly religion class at Loyola University’s Institute of Pastoral Studies, a Jesuit Catholic-run program for priests, nuns, and lay leaders. As the only self-identified nonreligious person in the class, I was regularly met with many questions. Once, a Catholic classmate cornered me in the elevator after class, proclaiming, “I’ve been dying to ask you about your atheism!” Yet it never felt like an affront--she and the others were genuinely (and understandably) curious. Sitting in class the day after my botched attempt at seeking secular community, I realized that I felt more at home with my religious colleagues than with the atheists from the day before. I looked around the room, focusing on each individual face; here were people who believed in a God I had theorized away years ago, yet they felt more like kin than most atheists I knew. While my classmates felt that their religious beliefs were right, they not only tolerated my beliefs but also enthusiastically embraced and challenged them. Even though many parts of the United States remain incredibly segregated, we live in the most religiously diverse nation on the planet, so one doesn’t need to be an atheist enrolled in a Catholic institution to know that many American citizens are by default required to coexist with people who believe radically different things. The question I found myself asking that day, however, went a step beyond that. It was not, “Can religiously diverse people coexist in peace”-- because, with some notable exceptions, Americans generally manage to tolerate one another’s differences. It was, instead, “Can we learn to seek out our commonalities instead of solely fixating on our differences” This idea that it is worthwhile to make an intentional effort to find common ground is, to me, the difference between mere diversity and engaged pluralism. It is a question that our nation--in which a solid majority of Americans associate the extremists of 9/11 with all Muslims--is not close to resolving. The challenge of engaged religious diversity--of intersecting religious difference--is one that atheists know perhaps more intimately than most. In a nation full of believers of all stripes, we are, in a sense, outliers. This is perhaps why so many atheists today ask for equal airtime alongside our religious neighbors--we want to be taken seriously, to be seen as equally ethical individuals. The unfortunate side effect is that many atheists demand this at the expense of talking to our religious peers in a way that affords them dignity and respect. Several years ago, Harvard Humanist chaplain Greg Epstein wrote a book called Good Without God, and his thesis was a simple but important one: our society must move beyond the question of if one can be good without God to how this may be accomplished. I join Greg in wanting people to move beyond wondering whether I am a moral individual, but I also join him in a companion call to our own community: atheism must move beyond defining itself--both in thought and in practice--in opposition to religion. If secular Americans want to be respected in our religiously diverse culture, we need to recognize that there is nuance and complexity in the diversity that defines it. Click here to listen to Stedman on Minnesota Public Radio's "The Daily Circuit." The stunning popularity of the "New Atheist" movementwhose most famous spokesmen include Richard Dawkins, Sam Harris, and the late Christopher Hitchensspeaks to both the growing ranks of atheists and the widespread, vehement disdain for religion among many of them. In Faitheist, Chris Stedman tells his own story to challenge the orthodoxies of this movement and make a passionate argument that atheists should engage religious diversity respectfully. Becoming aware of injustice, and craving community, Stedman became a "born-again" Christian in late childhood. The idea of a community bound by Gods lovea love that was undeserved, unending, and guaranteed—captivated him. It was, he writes, a place to belong and a framework for making sense of suffering. But Stedmans religious community did not embody this idea of Gods love: they were staunchly homophobic at a time when he was slowly coming to realize that he was gay. The great suffering this caused him might have turned Stedman into a life-long New Atheist. But over time he came to know more open-minded Christians, and his interest in service work brought him into contact with people from a wide variety of religious backgrounds. His own religious beliefs might have fallen away, but his desire to change the world for the better remained. Disdain and hostility toward religion was holding him back from engaging in meaningful work with people of faith. And it was keeping him from full relationships with themthe kinds of relationships that break down intolerance and improve the world. In Faitheist, Stedman draws on his work organizing interfaith and secular communities, his academic study of religion, and his own experiences to argue for the necessity of bridging the growing chasm between atheists and the religious. As someone who has stood on both sides of the divide, Stedman is uniquely positioned to present a way for atheists and the religious to find common ground and work together to make this worldthe one world we can all agree ona better place. 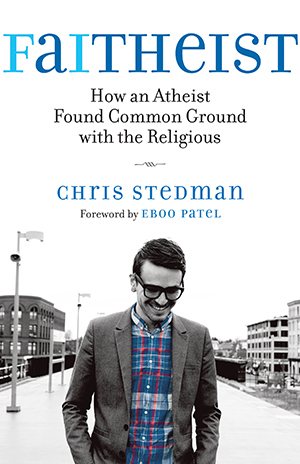 Chris Stedman is the Interfaith and Community Service Fellow for the Humanist Chaplaincy at Harvard University, the emeritus managing director of State of Formation at the Journal of Inter-Religious Dialogue, and the founder of the first blog dedicated to exploring atheist-interfaith engagement, NonProphet Status. Stedman writes for the Huffington Post, the Washington Posts On Faith blog, and Religion Dispatches. He lives in Boston. Stedman writes that our culture increasingly asks us to check our religious and nonreligious identities at the door-to silence the values and stories we hold most dear (13). Whether youre religious or nonreligious, have you ever felt pressured to check components of your identity at the door? What propelled you to do so? In this chapter, Stedman notes his rejection by both evangelical Christians and atheists alike. Have you ever experienced a confusing sense of isolation because youve associated comfortably with an unexpected group of people? Stedman recounts with horror how he discovered the existence of slavery and genocide while reading Roots, The Diary of Anne Frank, and Hiroshima. He notes that these books have deeply contributed to his moral framework concerning economic disparity, racism, and the overall affliction of minorities. Which texts have done likewise for you? Stedman writes: The radical nature of Christ as someone who tore apart the fabric of the social structures of His time rattled me in the best way possible (39). Who are some religious and nonreligious figures that exemplify certain values that strongly resonate with you? Stedmans mother took him to a minister to receive counsel after she became aware of his moral dilemma over homosexuality. Though she had been previously disengaged with religion, she recognized that meeting with a religious authority might be meaningful to her son at that particular time. What do you think Chris learned from her openness toward her sons convictions even though she didnt share the same beliefs? About meeting Randy, Stedman writes, It was one thing to hear that it was okay to be gay from a straight Christian minister, but meeting someone who could relate experientially to the struggles I had faced was something else altogether (64). How has meeting someone who has been stigmatized changed your ability to talk to others about it? What admissions might help others if you would open up about them more often? Even though he is an atheist, Stedmans former ardent belief in God affords him a better understanding of religious people. Have there been times in which youve been able to better understand anothers experience because of beliefs you once held? Do you meet their convictions with a patronizing attitude or with openness? Deciding that religious identities were irrelevant to the work he was doing, Stedman was unwilling to become familiar with the religious identities of his Muslim colleagues at BCCC. Along with veiling his own experience, he neglected an opportunity to learn about a community he was generally unfamiliar with. Have you stifled growth in your relationships because of an unwillingness to engage your own or anothers religious or nonreligious identity? In what other areas might you implement a "dont ask, dont tell" policy? Because the majority of his social relationships before attending college were built around his original involvement with Christianity, Stedman was initially hesitant to open up to those around him about his loss of faith. How might the current atheist movement be able to learn from aspects of the LGBT movement in terms of encouraging visibility and coming out? How might students who self-identify as LGBT or nonreligious (or both) receive encouragement to speak up at religious universities? When Stedman talks with the group of men in Chicago who had verbally assaulted him and his friends, one man admits he had never actually met a homosexual. This interaction shattered certain misconceptions and possibly prevented other LGBT individuals from being ridiculed in the future. Have you ever had a similar experience in which simply getting to know someone had a powerful humanizing effect? Guilt is a recurring theme throughout Stedmans journey. Once feeling guilt for doubting the existence of God, Stedman takes a trip to El Salvador in Chapter Five and wrestles with guilt for "having looked for a sign of God." In which instances throughout Chapter Six do you sense that he seems able to let go of both dimensions of guilt? In this chapter, Stedman writes about the "competing and often contradictory goals among self-identified atheist activists" (153). Though a firm atheist, he vehemently opposes the notion that he must work to bring about "the demise of religion." Rather, he has chosen to work towards religious pluralism-but not without receiving criticism for it. What are some specific difficulties faced by atheists who engage in interfaith work? While describing the backlash President Obama received for being "accommodating of atheists," Stedman writes of the pervasive idea that "any Christian who advocates for atheist inclusion isnt a real Christian" (151). If you are a Christian, have you ever felt that your faith would be jeopardized by encouraging social and civic equality with atheists? If so, how has that affected your ability to engage in constructive dialogue with secular people (as well as with members of your own community)? Stedman notes that "a Muslim speaking out against religious extremism will probably be better received by Muslim communities than a Humanist" (167). What religious or nonreligious group would be most receptive to your interfaith message? In an interview Stedman said, "A separate hope I have for this book is that it might encourage young people to step out into the public arena with their stories and their beliefs. I believe young people have the capacity to do such good work in the world, but many dont feel they have the authority to speak, or to act, or to influence." If youre a young person, how might you minimize your experience and beliefs regarding your faith, sexual orientation, or other aspects of your identity because of your age? What feature of being young makes you hesitant to share or to get involved? Observing Stedmans flux and change, how might you hold your ever-changing perspective in tension with the fact that your story matters now? Are you interested in building relationships across religious and nonreligious boundaries by working on local and global projects together? The Interfaith Youth Core has compiled a resource for any individual who wants to get involved. Access it here.